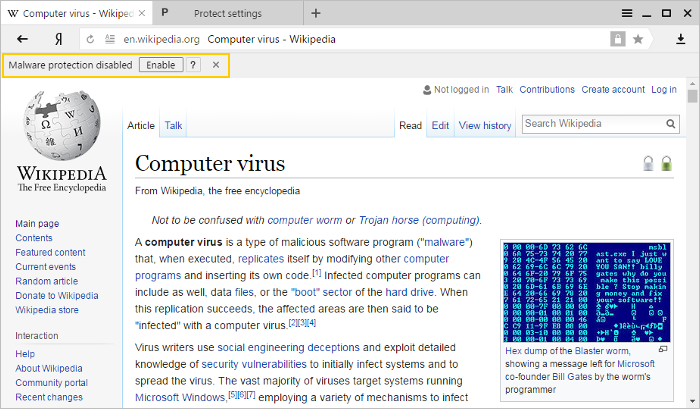 Other computer users or malicious extensions can also disable your protection without notifying you. If protection is disabled, malicious codes can infect your computer or give hackers access to your personal information and electronic payments. To re-enable protection, click the Enable button in the message. You can also enable protection in the settings. Under Protection from malicious files and websites, enable blocking of malicious sites and files (Run security checks on websites and downloaded files option).